I mostly review books on this website, but I also really love horror movies. As I continue working on my own horror screenplay (details to come!) I’ve been watching all types of horror movies as inspiration and research. 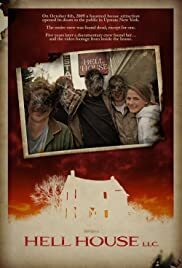 Recently, I stumbled upon one that I absolutely loved: Hell House LLC. This is a low-budget indie film that was just as effective, if not more so, than a lot of mainstream flicks with larger budgets. The premise is simple but fantastic and fresh. This is a mockumentary-style found-footage film about a film crew that is making a documentary about a tragedy that happened at a Halloween haunted house attraction a few years before. As they piece together what happened, they learn that something sinister might have been lurking in the house well before the haunted house crew set up their theatrical props. One of the things I loved about this movie is that there are very few jump scares. They are used judiciously and effectively, and the general ambiance of the film and the tension as the viewer is waiting to see what is going to happen next create a genuine feeling of dread. This film works because it has a fresh concept, builds tension well, and doesn’t rely on excessive slasher-like gore to create the feeling of horror. It’s just genuinely creepy and contains characters whose lives you really start to care about. There’s also an element of mystery pervading the storyline. This film came out in 2015, and I just learned that they are working on a sequel. I’m so excited to see what is in store next! Have you seen this one, or do you have a great indie film you want to share? Be sure to let me know in the comment section!